Marriage proposals are defining moments. When you decide that you want to ask one person to be with you for the rest of your life, you want everything to be perfect. 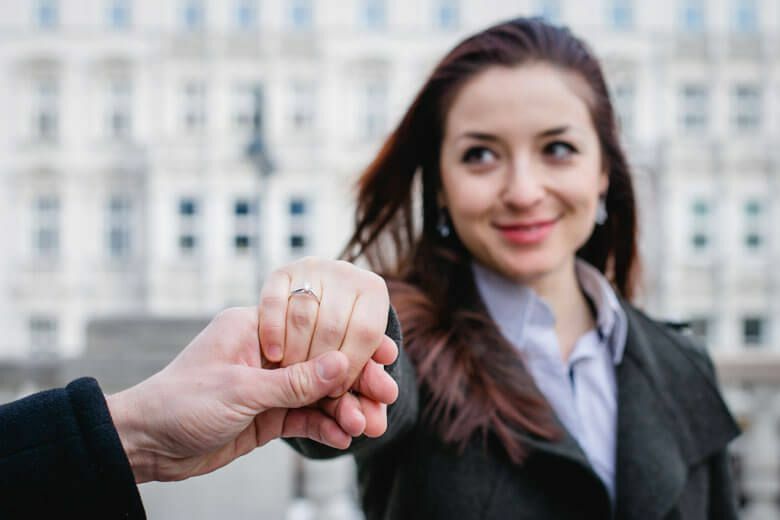 Planning a spectacular proposal to show your love to your special person can be incredibly stressful, but we have some great tips to help you pull off the perfect proposal. 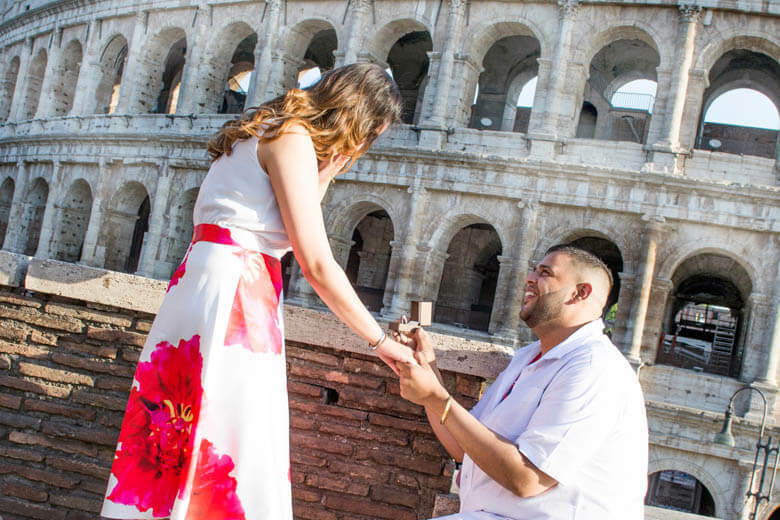 It has become increasingly popular to hire secret photographers to capture the proposal, so you and your loved one will always be able to look back on the special moment. This can also add another stressful element to the planning because you have to find a way to hide your plan. Luckily, some creative people have come up with some clever ways to pull this off. Your first option is to have a paparazzi style photo shoot, where your photographer will blend in with a crowd and pretend to be a tourist with a camera photographing random sights. This option works perfectly in very popular locations, such as city centers. Another option is to arrange a regular photo shoot without letting your significant other know that you will propose. 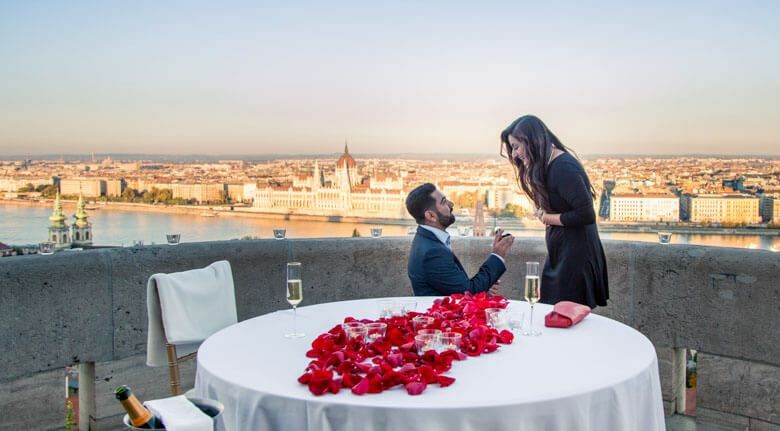 This option is perfect for people who want to propose in a more private setting. The third and final option isn’t highly recommended since the others work great, but your photographer can hide in a bush or behind something in order to capture the surprise in a really intimate setting. Once you decide on how you will propose and how you would like it to be photographed, you will need to start coordinating the proposal with your photographer. You will need to make sure you have all the details worked out, so it goes as smoothly as possible. You should discuss location options with your photographer, and once you choose a place, you will need to communicate the exact spot and how you will be standing. This allows you and the photographer to make sure the background and everything is perfect in the photos. We highly recommend that you clarify the exact spot of the proposal with a printscreen from google street view, so there is no confusion. After the location is all decided, you will want to make sure that the photographer knows the exact time you plan to propose. You will need to work with your photographer and listen to his or her suggestions, so you can make sure that you get the best lighting for your photos. Most photographers will suggest you propose around sunset for the best lighting, which is perfect since that’s already such a romantic setting. Lastly, you will want to make sure the photographer has seen photos of you and your significant other, so he or she will be able to recognize you. It will be helpful if you also let him or her know what you will be wearing. If you are able to keep it a secret, you should have a way to communicate with the photographer on that day, so you can let them know what you will be wearing and if everything is going according to the plan. There are so many important decision in a proposal. After you choose the ring, the location is one of the most important decisions to make. Since this is going to be such a memorable moment captured in photos, you will want to consider what will look good in the background. You should choose an iconic location or a place that has a special meaning for you. For example, this could be the place where you first met, shared your first kiss, or even your first vacation together. As we mentioned before, you will want to make sure that you and your photographer are on the same page and know exactly where the proposal will happen. The sooner you decide this, the sooner your photographer will be able to help you with details, such as where he or she will be and the direction you should be facing in the moment of the proposal. Since this is such an important moment in your lives, you will want to make sure that you and your loved one are both dressed nicely. You will want make sure your appearances are neat, and you will want to avoid wearing a lot of colors or clothing that has random advertisements or huge signs. 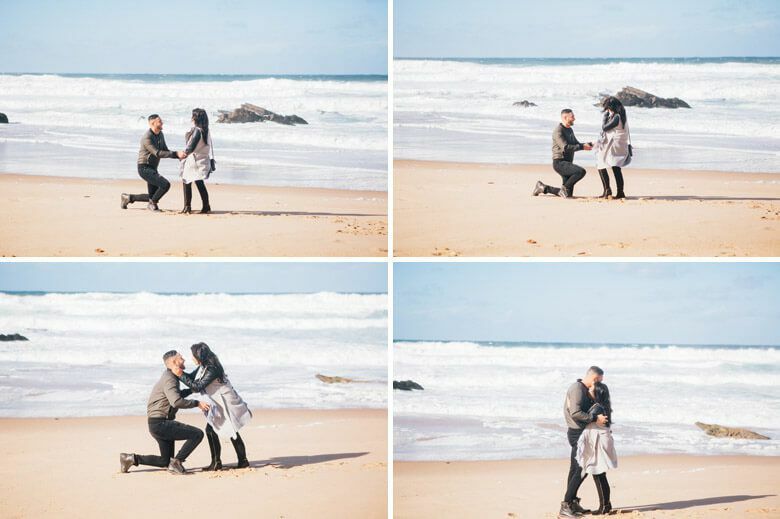 It might be difficult for you to tell your loved one how to dress and keep the proposal a secret, but we can assure you that he or she will appreciate it when the photographer is revealed. In order to not give away the surprise, we recommend that you tell your significant other that you are going to a concert, theatre, or nice dinner. You should already know how the big moment works. 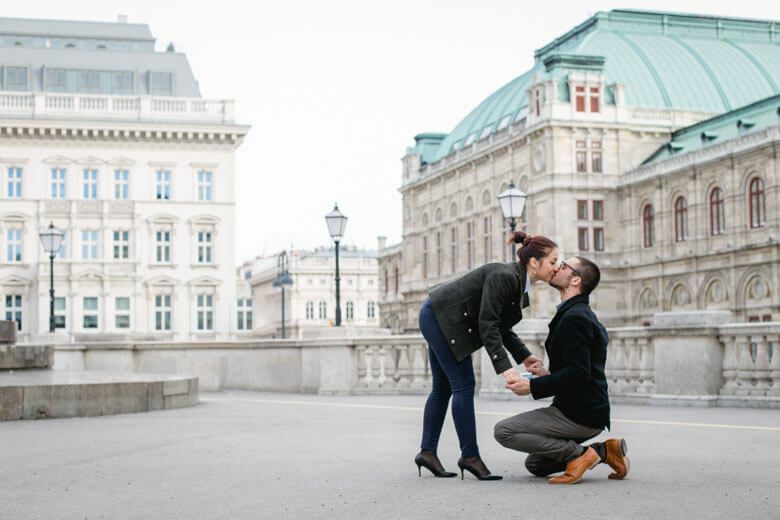 You get down on one knee and pop the question, but we have some tips you should keep in mind to make the proposal and photography go as smoothly as possible. When you get down on one knee, don’t rush it. Instead, stay in that position a little longer, so that your loved one can fully soak it all in. This also gives the photographer more opportunity to get the perfect shot. It should go without saying that you should only have the ring in your hands. You won’t want to be holding on to your phone or a camera when you are getting down on one knee. These things could get in the way and cause you to fumble. They also won’t look good in the photos. The best photos would be of you holding the ring or the ring box. You will also want to make sure you don’t have your wallet or phone in your trouser pockets because that doesn’t photograph well, especially when you are down on one knee. The photos will also look better if you can avoid holding bags or backpacks, so the main focus is on you, your loved one, and the ring. Hopefully, it shouldn’t be hard to keep your focus on your loved one, but you may be tempted to look at the photographer. You should avoid this as best as you can, so you don’t ruin the magical moment or the organicness of the photos. Instead, you should enjoy this once in a lifetime moment by hugging, kissing, and holding each other. You can always introduce yourself to the photographer later! Once your loved one has agreed to spend the rest of his or her life with you, the stress is all gone. You can now relax and bask in the magical moment. After the proposal, you can finally introduce the photographer to your fiance and let them in on the wonderful secret you’ve been keeping. Once he or she knows about the photographer, you can start right into an engagement photo shoot. These photos are perfect for save-the-dates or wedding invitations. During this time, you will want to make sure you get a shot of the stunning ring. You should also have something romantic planned out for after the proposal. For example, you might want to make a reservation to a romantic restaurant for an incredible dinner and champagne. With all that there is to consider when planning a proposal, it is good to have someone there to assist you. Our vacation photographers can help you with all of the details that might be stressing you out: choosing a location, choosing a time, and arranging the details of the surprise photo shoot. With that peace of mind, you can focus on what’s most important, asking the love of your life to spend forever with you.